Brand New Simmons Beautyrest BackCare Massage Chair! 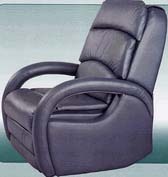 NEW Simmons Beautyrest BackCare Massage Chair - BackCare Atlantis 8-Roller Leather Shiatsu Massage Chair with LED Wand. This great Shiatsu Massage chair comes with an LED control Wand, child saftety lock and 5-minute demo video. Brought to you by Simmons - the Beautyrest Mattress company. Top Quality Grade 1 Italian Leather seating surfaces. Simmons 5 year In-Home Warranty! NEW OTTOMAN Robotic Calf & Foot Massage - Human Touch Technology® is Interactive Health's next generation of robotic massage technology. Developed in cooperation with the medical community, this technology delivers a completely new level of massage functionality, emulating the techniques used by chiropractors and massage therapists. 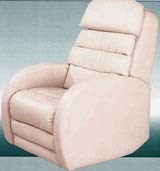 Add to any chair to get the same foot/calf robotic massage as the new HTT-10 Massage Chairs! !